Home Porsche Driver’s Selection Exclusive children's items from Porsche. Soft animal and car toys for sweet dreams. Soft animal and car toys for sweet dreams. Cuddly animals and cool furry car toys are much loved by small children. The motorsports bear makes an exclusive gift which gives little ones a passion for motorsports through play. Different sizes and designs are available, depending on the age of the child and the occasion. Tiny car lovers will sleep well nestled up to a 911 cuddly toy, especially when they have played with the Carrera slot-car set with Mummy or Daddy during the day. 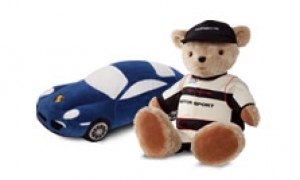 Soft animals and the other special toys from Porsche Driver's Selection make unusual and exclusive gifts.